A giant wall is being built across Africa, but much to Donald Trump’s dismay, this one isn’t designed to segregate. 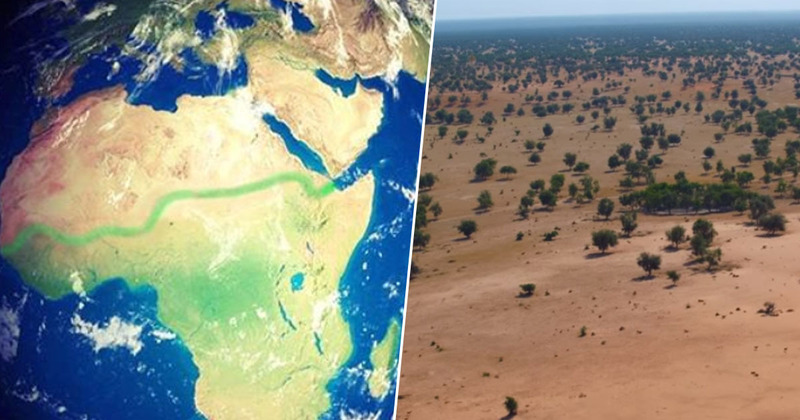 The Great Green Wall is an incredible African-led movement, which aims to grow an 8,000km wall of trees across the entire width of the continent at the southern edge of the Sahara desert, a region known as the Sahel. Over 20 countries have joined together to take on the mission, which began in 2007 and once complete, the creation will be the largest living structure on the planet. The Sahel was once full of lush foliage, but the effects of population growth, unsustainable land management, and climate change have turned the landscape barren. At the moment the wall is only around 15 per cent complete, but already surrounding communities have seen incredibly positive results as the wall battles desertification. Good News Network report over 12 million acres of degraded land has been restored in Nigeria, while roughly 30 million acres of drought-resistant trees have been planted across Senegal, and 37 million acres of land have been restored in Ethiopia. On top of combating desertification, the Great Green Wall is making moves against poverty by creating more jobs, as well as refilling groundwater wells with drinking water, and providing rural towns with additional food supplies. When there were no trees, the wind used to dig up and erode the soil. But it is more protected now. The leaves provide compost and the canopy increases the humidity of the environment and offers some shade, so there is less need for a lot of watering. Before there was widespread drought and hunger here. Then the tree planting took place, and then a garden for the women to grow crops. It has really helped the people. Now we have 200 people working on it and they are being well paid. According to the Great Green Wall site, the end goal is to restore 100 million hectares of currently degraded land, sequester 250 million tonnes of carbon and create 10 million jobs in rural areas by 2030. The initiative is already bringing life back to Africa’s degraded landscapes at an unprecedented scale, providing food security, jobs and a reason to stay for the millions who live along its path. Hopefully the wall will continue to grow and offer endless benefits to the surrounding communities.